This book constitutes the refereed proceedings of the 18th IFIP WG 5.5 Working Conference on Virtual Enterprises, PRO-VE 2017, held in Vicenza, Italy, in September 2017. The 68 revised full papers were carefully reviewed and selected from 159 submissions. 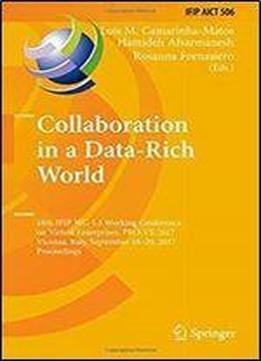 They provide a comprehensive overview of identified challenges and recent advances in various collaborative network (CN) domains and their applications, with a strong focus on the following areas: collaborative models, platforms and systems for data-rich worlds manufacturing ecosystem and collaboration in Industry 4.0 big data analytics and intelligence risk, performance, and uncertainty in collaborative data-rich systems semantic data/service discovery, retrieval, and composition in a collaborative data-rich world trust and sustainability analysis in collaborative networks value creation and social impact of collaboration in data-rich worlds technology development platforms supporting collaborative systems collective intelligence and collaboration in advanced/emerging applications: collaborative manufacturing and factories of the future, e-health and care, food and agribusiness, and crisis/disaster management.